The Occupy Wall Street and related groups have brought to the fore concerns about the distribution of income in the US. And there is validity to these concerns, as the distribution of income has deteriorated markedly in recent decades, starting with the Reagan period in the 1980s. The share of the top 1% has well more than doubled, to a level not seen since the 1920’s just prior to the Great Depression, with this coming out of a declining share of the bottom 90%. The graph above is taken from material assembled by Professor Emmanuel Saez and his colleagues and co-authors, and is available through his web site (link here). The specific data here is from a July 2010 update of material originally published by Professor Saez with Professor Thomas Piketty in 2003, with data now through 2008. Professor Saez and colleagues from around the world have assembled an amazing set of data for a large number of countries, using tax return data to produce long time series of family (tax unit) income levels. Such data can go much farther back in time than available income surveys will allow, to produce historical data otherwise unavailable. While there are drawbacks (for example, tax units are not always the same as the household units one would prefer), nothing else can span such periods of time. 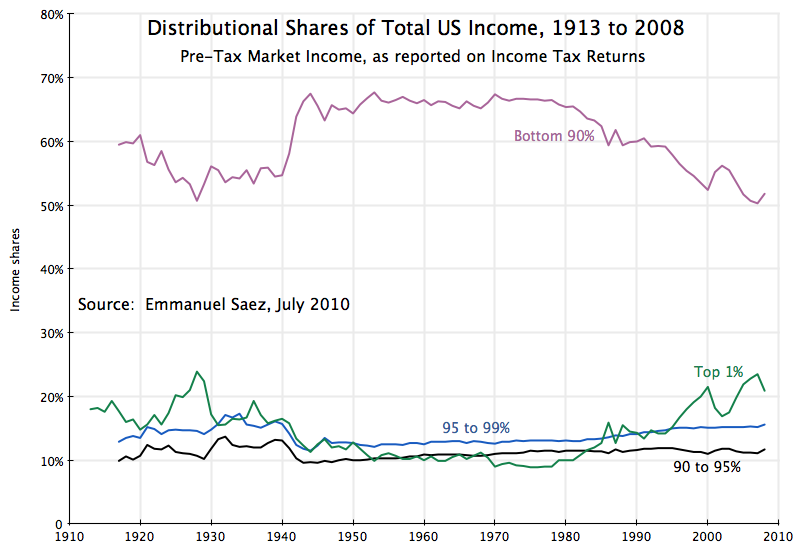 The US data show that there was a previous boom in the 1920s in the income share of the top 1%, peaking at 23.9% of national income in 1928. But the share then fell in the Great Depression and during World War II, and with the reforms and structural changes implemented during that period, eventually came to about a 10% share in the 1950s and 1960s, and to about 9% in the 1970s. But it then started to grow, and reached a 23.5% share in 2007. It fell back in 2008, with the onset of the financial collapse in the last year of the Bush Administration. But as noted in this blog posting of November 26 on this site, profits rebounded in 2009 to now, so it is likely the top 1% share has also rebounded. It is also interesting that this increase in income concentration is essentially only at the very top: the top 1% is seeing almost all of the increase. Those in the 90 to 95% percentile, and in the 95 to 99% percentile, have seen some trend rise in their income shares in recent decades, but they have been close to flat. Rather, the higher share of the top 1% has come out of a falling share of the bottom 90% (the shares of all groups together must sum to 100%). The share of the bottom 90% has dipped to about 50%, from a level of about 65% (plus of minus a percentage point or two) from 1942 to 1982. This is a remarkable change after four decades of such stability. Another interesting calculation, done by Professor Saez, found that 52% of the increase in real national income between 1993 and 2008 accrued to the top 1% of families, even though this top 1% only had a 14% share of national income at the start of this period (and 21% at the end). That is, more than half of income growth over this 15 year period went to just the top 1% of the population, and where this group accounted for only a 14% share of income at the beginning. Had the growth been balanced, the top 1% would have obtained 14% of the income growth, not 52% of it. The data here does not explain why there has been this increasing concentration of income in the US. One has also seen increasing concentration in other countries around the world in recent decades (the data is available here), which suggests some basic global structural changes are part of the cause. But the global pattern has not been as extreme as in the US, suggesting that policy changes in the US begun under Reagan and continued since, are also part of the cause. This entry was posted in Distribution of Income and tagged income distribution, National Income by aneconomicsense. Bookmark the permalink.